Should I use a chemical seal with my pressure instruments? 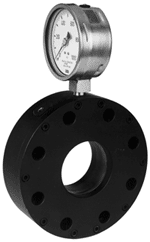 Pressure instruments in contact with the process can take a real beating. Process fluids can corrode the wetted parts and destroy the sensing element. Media the solidifies can clog the pressure-sensing port. Or, an installed instrument can affect the process by providing a spot for media remnants to remain after cleaning and purging. Specialized chemical seals deal with these pressure sensing issues. Here’s a list of questions to ask about your application that will determine if you need a chemical seal with your gauge, switch, or transmitter.